One of the most popular home remodeling projects we do for clients in the Minneapolis and St Paul areas is porch additions. Two of the most popular types of porches we create are 3-season and 4-season porches. There are some key differences between the two. In this blog, we’ll explain 3-season porches and 4-season porches, and how they can be a great addition to your Minneapolis/St Paul area home. A 3-season porch is very much like a room addition, except it does not need to be insulated or have interior finishes. Three season porches do not have climate control (they are not heated or cooled). Many clients have used their 3-season porch (also known as a sunroom) as a getaway area, thanks in part to the ability to have as many windows as one would like. These porches are intended for spring, summer and fall (hence the name), as they do not need to meet energy code standards. However, you can add a fireplace to the room to keep it warm in the colder months. Whether this can be a gas fireplace or has to be wood burning is really up to the city in which you are building the porch. You can have a 4-season porch built on a full foundation (which will add more cost) or poured footings. Since it’s like adding on another room, it will also require heating and ventilation, but this is usually not too difficult. If you want your porch to offer increased long-term home value, then it’s best to go with a 4-season porch. 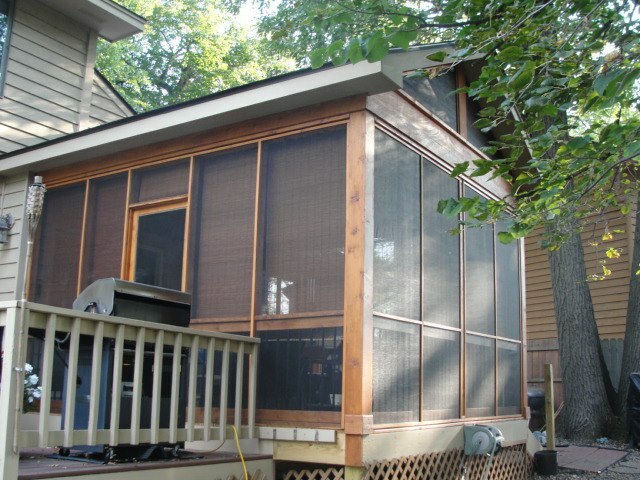 However, if your budget doesn’t allow for the energy code requirements associated with a 4-season porch, you can make your 3-season porch or sunroom more comfortable by adding portable heaters, window AC units and more. Thinking about a 3-season or 4-season porch? Give us a call at (952) 444-2301 or Click Here to Request a Free Quote.